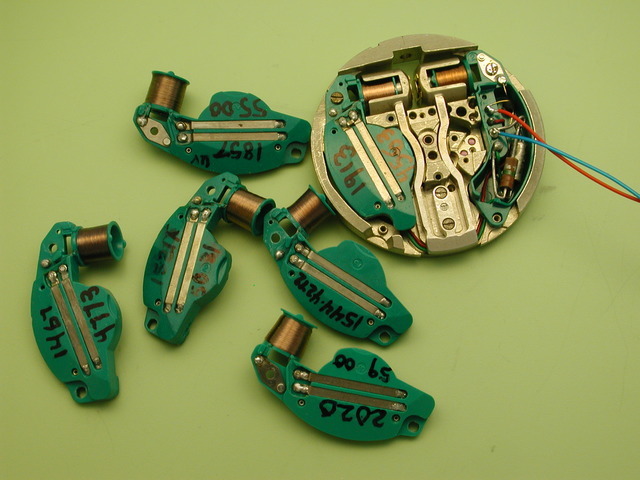 These are various experimental rewound Accutron 214 coils. Some are for 3-wire circuit coils and some are for 2-wire. The two numbers are the number of turns on the sense coil (smaller number) and the drive coil (larger number). The 214 movement has everything removed except two coil screws and two tuning fork screws. The circuit coil is original except it's tapped for measuring the operating characteristics of the circuit (the transistor's Vbe and Vce) with an oscilloscope. It's not too much trouble to hook up a coil for testing.